The first in-depth study to examine women's participation in Sufi rituals in Pakistan and India. The female voice plays a more central role in Sufi ritual, especially in the singing of devotional poetry, than in almost any other area of Muslim culture. Female singers perform sufiana-kalam, or mystical poetry, at Sufi shrines and in concerts, folk festivals, and domestic life, while male singers assume the female voice when singing the myths of heroines in qawwali and sufiana-kalam. Yet, despite the centrality of the female voice in Sufi practice throughout South Asia and the Middle East, it has received little scholarly attention and is largely unknown in the West. 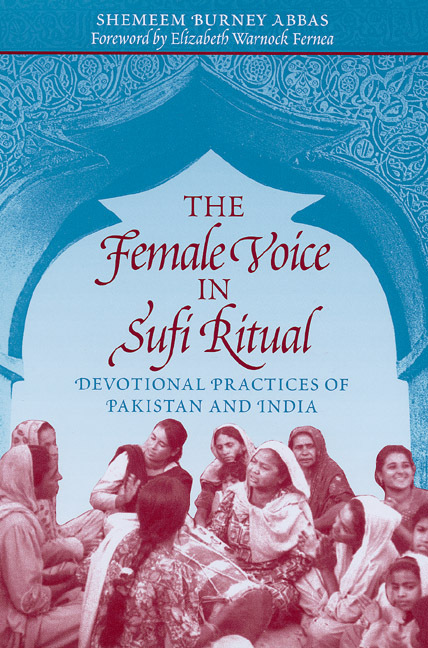 This book presents the first in-depth study of the female voice in Sufi practice in the subcontinent of Pakistan and India. Shemeem Burney Abbas investigates the rituals at the Sufi shrines and looks at women's participation in them, as well as male performers' use of the female voice. The strengths of the book are her use of interviews with both prominent and grassroots female and male musicians and her transliteration of audio- and videotaped performances. Through them, she draws vital connections between oral culture and the written Sufi poetry that the musicians sing for their audiences. This research clarifies why the female voice is so important in Sufi practice and underscores the many contributions of women to Sufism and its rituals. This book documents the place of women in Sufi practice in the subcontinent of Pakistan and India. Sama', or the context where devotional Sufi poetry is sung and heard, is almost unknown in the West but is widespread in the Muslim cultures of South Asia and the Middle East. Although it is a significant dimension of Sufi Islam, sama' is poorly documented and scarcely understood among the wider scholarly audience. Women's contribution to this is even less known. Despite the strong gender component of Sufi ritual discourse, the role of women has been ignored in scholarly work. It is very much a part of the living Sufi traditions in countries like Iran, Iraq, Turkey, Lebanon, Egypt, Syria, Morocco, Afghanistan, and Pakistan and India. In the Islamic world, the mosque is primarily an arena for male activity, with little visible participation of women in the rituals. In the major mosques in Pakistan, for instance, there is a small space where women can go and pray on Friday or on religious festivals such as the Eid. In the local mohalla mosques there is no possibility for a female to offer her ritual prayers. The domain is exclusively for male participation. Thus, the important spheres of religious and spiritual participation for women are the Sufi shrines. There, their input is visible and they are significant participants in events. We do not know whether Khusrau had any sisters, for the eastern philosophers generally do not bother themselves about the female relatives of a person; they are considered to be either too insignificant to be mentioned or too sacred and inappropriate to be brought into the glaring and unholy light of publicity. Western male scholars have ignored the field because, as men, they cannot access the female domains of participation. They cannot enter the culturally close-knit networks among women in the ritual participation at Sufi shrines or at the community festivals, called melas, where much activity takes place. Furthermore, they have been handicapped due to their lack of knowledge of the indigenous languages. They cannot fathom the nuances of the discourse in which the ritual linguistic play of Sufi poetry is carried out but in which the illiterate yet informed audiences of the events are fully proficient through oral instruction. I bring my own understandings and experiences of the culture that I portray. I convey the intuitions and subtleties of an oral culture where information is passed through word of mouth, from person to person and from family to family. I am still astonished, though, when I hear housecleaners and daily-wage workers at car washes in Pakistan recite Waris Shah's Panjabi poetry from memory, or when the technicians at the Institute of Sindhology eduate me in the female myths of Shah Abdul Latif's poetry. When I make certain references, such as to child-marriage or widow-marriage, the western reader may no find scholarly references to the same subjects. When I transcribe Hazrat Amir Khusrau's lyric about child-marriage, the intepretation is novel because there is no documentation of the subject in the literature. There is scant literature on child-marriage, and it is only recently that nongovernmental organizations in the subcontinent started to address the issue as an object for social reform. To a native researcher like myself, such events are endemic in the contexts in which I work. Although no one has examined the material in the particular way I propose, my approach is within the accepted ideas and practices of the indigenous culture that I represent. There is little scholarly evidence available. I investigate the rituals at the Sufi shrines in Pakistan and look at female participation and the female voices in the ceremonials. My research is a linguistic anthropological study of discourse and poetry used in devotional settings. I apply a range of theories to interpret the data in the book: I have utilized the ethnography of speaking. In addition I have applied the conversation analysis system wherever appropriate to the context. The transliteration of live speech and its context in the performances is based on a conversation analysis scheme with adaptations, especially in the turn-taking among qawwals. I am aware that there are a number of theories about speech and performance, but I use only those that relate to my work. The field is broad and the research expansive. Therefore, I use references that I can link with the study. Many contexts and linguistic codes that I use are familiar to native scholars in Pakistan and India, but there are some features in the songs in the indigenous languages that western scholars may not understand. Thus, I bridge the gap between the East and the West in this book by giving a contextual interpretation of the lyrics in the translations. I have avoided a word-for-word translation but have made sure that the text is an authentic rendering of the poetic narrative that communicates the sophistication of the mood in which the musician sings. I transmit the flavor of languages such as Panjabi, Siraiki, Sindhi, and Urdu to the reader. I studied Sufi practices at the shrines of Bulle Shah in Kasur, Bibi Pak Daman, Data Ganj Bakhsh Hujwiri, Shah Hussain, and Hazrat Mian Mir in Lahore, Hazrat Lal Shahbaz Qalandar and Shah Abdul Latif in Sind, and Hazrat Bahauddin Zakariya and Rukunuddin Shah Alam in Multan. At these shrines I observed the rituals that both women and men performed. Some rituals were common to all shrines, and some were particular to just that shrine. For example, women participated actively in the support services at the Lal Shahbaz Qalandar shrine in Sehwan: a female muridiani gave water to the devotees. A woman was the caretaker of the tombs of Shah Abdul Latif's female relatives who were buried in a compound of the shrine. Among the rituals that I observed was one in which women devotees held up glasses of water to seek ritual blessings from the guluband or heart-shaped necklace that belonged to Hazrat Lal Shahbaz Qalandar and that hung over his tomb in Sehwan. The glasses of water were then shared with their kinswomen and men. To orthodox Muslims this may seem to be a fetish, but devotees draw strength from the ritual. My guide to Hazrat Lal Shahbaz Qalandar's shrine was a senior librarian at the Institute of Sindhology at Sind University in Jamshoro, Hyderabad. Although an orthodox Muslim, he was a devotee of the Sufi saint. Many like him go to the shrines because they look upon the spaces as venues for mediation and worship. There is tolerance among individuals like him for the rituals that devotees perform. In recent years, with the coming into power of orthodox Islamic governments in Pakistan, there has been a trend to extend and renovate the shrines of Sufis such as Hazrat Data Ganj Bakhsh Hujwiri in Lahore into mosques and places of worship. Data Darbar has been extended to almost ten times its original size and has been remodeled with the most expensive Italian marble. Huge congregations of devotees perform the Friday prayers in the shrine courtyard. I noticed the same feature at the Hazrat Mian Mir (d. 1635 AD) shrine in Lahore, which I visited this summer. The shrine had fallen to pieces almost a decade ago. It has been recently restored and is also used as a mosque. The audiences at the shrines come from a variety of socioeconomic backgrounds. Gender plays a role as can be seen in the discussions and the photographs in this book. Women come in large numbers. The majority of participants are rural peasants, factory workers, housewives, and middle-class devotees. A large number who come are illiterate but well versed in the oral culture. The shrines fulfill devotional needs and provide outlets from the chores of daily life. There are many affluent and well-to-do devotees at the shrines who go there for prayer and meditation and also to make a mannat (a vow). When that vow is fulfilled, they go to the shrine to make an offering— usually food or charity that they give in cash. Women as mystics in Sufi practices. Women as creators of Sufi poetry. Women who have influenced male Sufis in their roles as mothers, daughters, nurses, and mentors. Women as ethnographers and patrons of male Sufi mystics, such as the Mughal princess Jahan Ara, daughter of Shah Jehan. Women as singers/musicians/participants of Sufi songs, sometimes even called the faqiriani in the Sindhi shrines. Women as preservers and guardians of Sufi discourse or lore, such as Mai Naimat, a maidservant of Shah Abdul Latif, from whose memory his entire Risalo is said to have been reconstructed. Active "female" participants at the shrines, known as the hijras or eunuchs. They have been identified as khawajasara in earlier shrine traditions during the rule of the Muslim kings in India. The aesthetics of the female voice, a poetic device in which the speaker is the female, even in the narratives of male musicians. The musicians play with the syntactic and semantic structures of the languages to speak as though they were females. Singing in the falsetto, even by male musicians, to impersonate a female voice, as is done by the faqirs or musicians at Shah Abdul Latif's shrine in Bhit Shah. They mimic the heroines of Shah's poetry. The myths of female lovers, such as Sassi, Sohni, and Hir, used as aesthetic devices to speak of broader social, political, caste, and gender issues. In this study, concentrating on the oral culture of the subcontinent, I have found a common thread that runs through each myth, though Sufi poets may use the myths according to their own intention. Male protagonists in the myths are discussed, but in the oral traditions romance is created through the aesthetics of female voices. Male musicians whom I interviewed confirmed this. Although I focus on female voices in this study, there is substantial discussion of male participation as well. I bring in references to Amir Khusrau and his lyrics, to Ustad Nusrat Fateh Ali Khan, the Sabri Brothers, Shaikh Ghulam Hussain, and Alan Faqir. A large number of the lyrics analyzed in the book are the compositions of male Sufi poets. Whether or not the Sufi poets of the subcontinent wrote in empathy for women is an area of research in itself. The lyrics do have strong female voices, and I leave the field open for further exploration. The scope of this study is limited to its present undertaking as it is not possible to include every dimension of Sufism here. I do not discuss different versions of the female myths, or delve into male rituals, or bring in every theory or study that a scholar has done on Sufism. I document research in my own field for an informed, educated audience interested in the female dimensions of Sufism in the Pakistan-India subcontinent. I interviewed a wide range of female and male musicians of Sufi performances in Pakistan between 1992 and 1999. My first interview was with Ustad Nusrat Fateh Ali Khan in 1992 at the Marriott Hotel in Islamabad. Although the interview was a formidable undertaking, I was able to solicit responses to questions. My key questions to him were about singing in the gendered voice of Hir or Sassi. His responses are documented in this book. Within a month after my meeting with Khan, I was able to interview Abida Parvin and her musician husband, Shaikh Ghulam Hussain. I received valuable responses from both musicians and discuss them in this study. Although contacting key musicians was always a challenge and rather stressful, it was quite rewarding in the end when I transcribed the interviews. Alan Faqir even shared with me the politics of singing the female myths embedded in the poetry of the Sufi poets. I did additional fieldwork at the Sufi shrines and recorded women's input into the rituals that are performed on a day-to-day basis and during the 'urs or mela that celebrates the death anniversary of the Sufi saint. Major databases in this book are my own field recordings of performances. There is input from professionals such as music directors, producers, archivists, and scholars in Pakistan who are linked with the singing of ritual Sufi discourse at the shrines, in concerts, and in the media, especially the radio. The radio seems to ensure the continuity of this tradition in the popular culture among the speech communities. Although this book has developed from the fieldwork that I did in Pakistan between 1992 and 1999, it gains from the methodology that evolved during the first part of the research between 1985 to 1992, when I worked on my dissertation at the University of Texas at Austin. I depended on archival materials that were a comprehensive collection of multimedia resources from Pakistan, India, the United Kingdom, France, the United States, and Canada. The key archives from which I collected the materials were the Institute of Folk Heritage and the Allama Iqbal Open University in Islamabad and the Institute of Sindhology in Hyderabad, Sind. I obtained other materials from the School of Oriental and African Studies at the University of London and Oriental Star Agencies in the United Kingdom. Between 1985 and 1992, I focused on the musicians' speech samples and transcribed them meticulously. I saw the same patterns emerge in Urdu, Purbi, Hindi, Panjabi, Siraiki, and Sindhi poetry that the musicians sang. I found references to mothers and daughters, sisters and brothers, and generally to kin relationships with women. There were allusions to the mystic veil, to women's work, such as husking, grinding, spinning, and weaving, and most fascinating of all to bold female lovers like Hir, Sohni, Sassi, Layla, Mira Bai, and many more. In addition to singing devotional poetry that paid homage to the prophet Muhammad, his family, and his azwaj (wives) the musicians further recited the Prophet's hadith (sayings). They invoked bridal imagery to speak about the mi'raj (the Prophet's ascension) and the Prophet's meeting with the deity, when the veil is lifted or the state of kasf is attained. They sang about the Sufis of the Muslim world and about gender, class, color, and caste. Their discourse challenged the patriarchy and the establishment through the device of the female speaker; even in the metalanguage of the mystic ecstasy, the musicians spoke as females. These findings and the musicians'poetry sung to the mesmerizing percussion in the music became the impulse of the study. Most importantly, in the same period in the eighties when this study was maturing, world music was claiming Ustad Nusrat Fateh Ali Khan, and his qawwalis resonated in the concert halls of the West. He infused a new life into the qawwali by integrating the vibrancy of the Panjabi qawwali ang (style) with experimentation in musical forms, especially the subtle use of saxophone for instrumentation. His Panjabi qawwalis of the time are fascinating for the versatility of the linguistic resources, which portray the many female voices and which inspired the second phase of this study, focusing on the female speakers of Sufi poetry. He was able to infuse a subtle humor through language play in the qawwali, which is traditionally serious mystic discourse. Within the same time frame, Oriental Star Agencies in the United Kingdom was promoting musicians who sang Sufi poetry in concerts for the Pakistani and Indian expatriate speech communities. Invariably, the charismatic female voices in the musicians' narratives lent the performances elegance. I wonder if they were aware of it, or did they too suffer from the "paradox of familiarity" as I did? At home in Pakistan during this very period, Abida Parvin, a female musician, was framing her critiques of the orthodox establishment in public concerts, using the poetry of the Sufis of the subcontinent. It was at this time that I did substantial data collection of multimedia sources in Pakistan and the United Kingdom. I have created a large repertoire of transliterations from Sufi songs that I recorded at the shrines. Some transliterations produced from archival multimedia sources are documented. These are in Urdu, Purbi, Hindi, Panjabi, Siraiki, and Sindhi and include an engaging use of dialect by the musicians to communicate with their audiences. Some of the Panjabi dialects that portray the female speakers would be stigmatized by purists, but they give the flavor of popular speech, and that makes them unique. These are the dialects of the old walled city of Lahore from where I trace the ancestry of my maternal family and where I have my roots. These are the dialects of Gujranwala, Faisalabad, and Sahiwal, which are the heart of the Panjab. I found them in Ustad Nusrat Fateh Ali Khan's narratives, and now in Mehr Ali and Sher Ali's qawwalis. There are sections of qawwalis and sufiana-kalam where the musicians switch to elitist codes like Persian and Arabic or they switch codes intralingually, between, say, Siraiki, Sindhi, Panjabi, and Urdu. There is evidence of turn-taking among the qawwalis. These collections, together with my poetic "transmogrifications," are the data that speak. The many female voices form the basis of this study, and there is much more that speaks to an ethnographer; the material establishes its own authenticity. The transliterations verify the metalanguage of ecstasy; the cakki-namas and the carkhi-namas demonstrate the discourse of women's work at grinding and weaving. I found many linguistic and thematic variables in these databases that can be explored for future research. I stated earlier that I do not try to fit this book into any theoretical frame. I apply the ethnography of speaking and the conversation analysis frame. I let the musicians speak about the female voices, about themselves, about their linguistic resources, and about their songwriters. They are the ones who tell about the roving minstrels and answer the host of questions that the research generates. Shamsuddin, a brave and generous monarch, welcomed to his capital many unfortunate people driven from their homes by the Mongols. "Towards men of various sorts and degrees, Qadis, Imams, Muftis and the like, and to darweshes and monks, land-owners and farmers, traders, strangers, and travelers from great cities, his benefactions were universal. From the very outset of his reign and the dawn of the morning of his sovereignty in congregating eminent doctors of religion and law, venerable sayyids, maliks, amirs, sadrs, and (other) great men, the Sultan used, yearly to expend about ten millions; and people from various parts of the world he gathered at Delhi." My mother, like other Muslim women in the subcontinent, had a home education and was proficient in reading and writing Persian, Arabic, Urdu, and English literary texts. She was a writer for Ismat, a leading women's journal, which I read as an adolescent and which made me proficient in Urdu. Muslim women among the elite, including Mughal princesses such as Jahan Ara Begam, daughter of Shah Jehan, were educated at home with erudite female mentors who were related to distinguished male doctors of medicine, letters, sciences, history, and the arts.These women were accomplished in classical Arabic and Persian texts and could recite them mnemonically. Interestingly, I have found evidence in the same source from M. Wahid Mirza about my paternal ancestry, which is claimed from Ziya'al Din Barani (1285-1361 AD). He was the author of Tarikh-e Firuz Shahi, a history of the Muslim monarch Firuz Shah Tughlak (1351-1388 AD), who was probably of Turko-Mongol stock and came from Khorasan during the reign of the Khilji sultans. Barani's history of the Delhi sultanate in the thirteenth and fourteenth centuries is additionally a major source to study the Muslim ethnomusicology of the time. A substantial portion of Mirza's study of Amir Khusrau used Barani for a resource. I was born in Pakistan and raised in the North Indian and Bengali traditions of ethnomusicology and poetry, which I further claim from my father, who was an architect educated at Rourkee and Aligarh. I grew up in Bangladesh, which was then East Pakistan and had, immediately after partition, a strong musical tradition. The context was all around me. My father was posted there to build Comilla cantonment. He was a connoisseur of music who played the tabla with articulation. My mother played the sitar. I can now see the gradual evolution of the present study from a multicultural background: the Panjabi and Siraiki Sufi literary, musical, and linguistic traditions from the maternal side; they were the Muftis and Gardezis who belonged to Lahore and Multan. Among the paternal roots is the Burney lineage from which I inherit the North Indian cultural, musical, and linguistic traditions of "UP," now Uttar Pradesh, of Buland Shehr near Meerut. I shall now let the musicians of Sufi melodies speak for themselves. My role is that of the interpreter of the culture. Note: Readers who would like to learn more about the music discussed in this book are urged to acquire the CD (with accompanying explanatory material), Troubadours of Allah: Sufi Music from the Indus Valley, available from Weltmusic Wergo, Postach 36-40 D-55026 Mainz DDD LC 06336, ISBN 3-7957-6072-0.